Years of marketing hype from Airbus, the double beds on Singapore Airlines’s A380 and Emirates’s hugely successful A380 business class bar sharpened the senses of the media and guests for the first inspection of the finished Qantas A380 product. When the A380 first appeared in January 2005 at the ‘A380 Reveal’ the question two billion air travellers wanted to know was just where were the duty free shops, bowling alleys and McDonalds? The reality that has been revealed since is that they were just wild marketing dreams to grab headlines around the globe. Interestingly, while critics slammed Airbus for promoting shops, bowling alleys and the like, Boeing was using the same ridiculous spin for its 747X program back in the late 1990s. Even worse was a presentation by McDonnell Douglas to Air France in 1992 under the title “21st century flying” on its proposed MD-12 super jumbo. MDC promised light exercise facilities and showers, lounges, office in the sky, children’s quiet [yeah right] area/play area, duty free shopping and games rooms. In fact, MDC takes the prize(s) for the most absurd suggestions for inflight amenities, promising a gym complete with exercise bikes and dumbbells on the MD‑12, and installing a disco, complete with band, on its DC-10 mockup in 1972. With expectations hyped up by aircraft manufacturers, designers such as Qantas’s Marc Newson have had to grapple with enormous expectations in their quest to balance economic reality with passengers’ laundry list of wants and dreams. 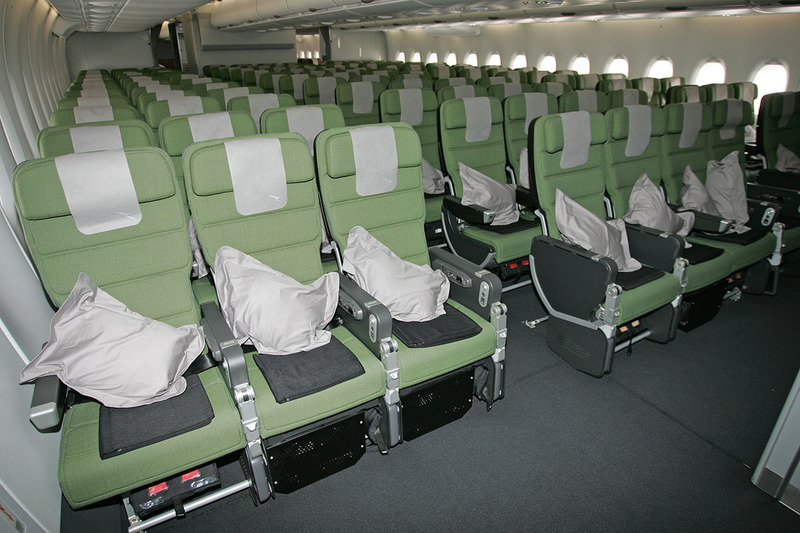 Even the conservative Qantas has had to pare back on its initial plans which included special lounge areas in the first, business and economy sections, facilities for business meetings and business presentations, and a substantial improvement in economy class in terms of space for passengers and seating. And when the airline revealed its interior to just one journalist – armed with a basic flash camera – in Hamburg in June – the interior was ridiculed. One wag suggested that if “Marc Newson was trying to re-create a 1960s retro Russian look” he had succeeded. Another thought the inspiration for the green zone in economy had come from either the RAAF’s C-130s or NSW suburban rail carriages. The infamous green economy class cabin, but flash photography doesn’t do justice to the green, it looks better in the flesh. Yet another likened the first class seats to a dentist chair and quipped that passengers might like to get their dental work done on a Sydney-LA flight. So what was the reality of the Qantas reveal? A delightful surprise of quiet elegance. The overall colour theme of the sidewalls and ceilings is a light gun metal grey, the effect of which is completely lost in any flash photography. 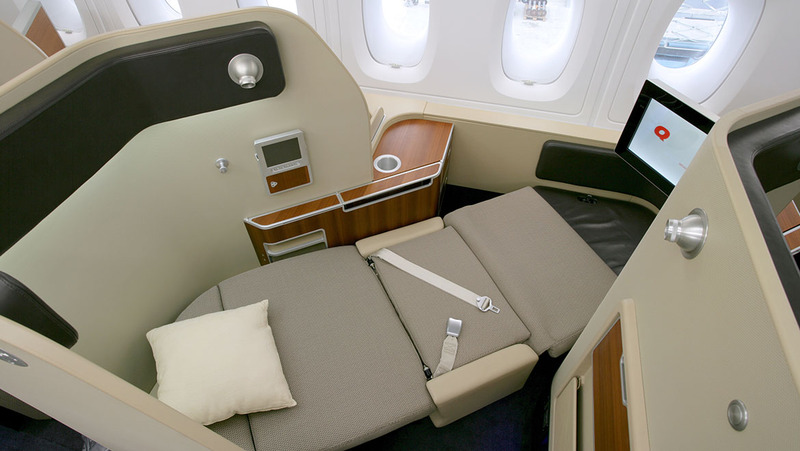 Throughout the giant jet passengers’ cushions are a light silver with black blankets adding to the sophisticated look. Marc Newson, who has won countless awards, suggested to Australian Aviation that while most aircraft interior designers look to bring exterior furnishings into the aircraft cabin he looked to aviation for his inspiration and the results are stunning. “I love flying and my interiors are inspired by flying,” he said. Newson said he had been working on the design for six years and in fact has essentially designed every aspect of the interior from the toilet door handle through to every aspect of the first class seat. Aside from the colour theme the other driver was openness and Newson wanted to ensure that passengers had plenty of space and didn’t feel claustrophobic. He and Qantas were “not phased” by Singapore Airlines’s double beds. Qantas’s first class suites are unique and cleverly combine privacy with spaciousness. On the delivery flight Australian Aviation had the opportunity to press all the buttons – and there were plenty of them – and was impressed. One of the many neat features was a visual control panel which showed you in real time what was happening as your seat swivelled to form a large bed. Flight attendants will take orders from your seat in first and business class using a PDA and your selections will light up the galley monitor, speeding meal delivery. Newson said the airline looked at showers from every angle but couldn’t make the case. In business class Newson said the airline went back to a clean sheet but couldn’t get away from [his] the award winning Skybed, although the extra space allowed for some improvements. The major change was a wider seat/bed and significantly increased length/pitch from 69in (175cm) to 80in (203cm), meaning an end to ‘stepping over’ sleeping feet. The Skybed also reclines into a truly flat bed. 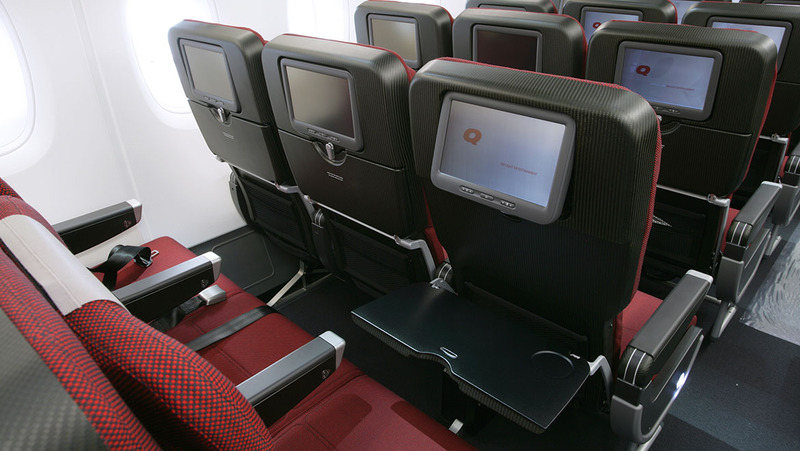 Qantas has added a five-seat lounge at the front of the busines class cabin on the A380. Some passengers on the delivery flight gave it the thumbs down, others were more impressed. It can seat just four people in comfort and is tucked into a corner, where Emirates has put one of its two showers, which gives perspective to the amount of room available. There is also a small self service bar, which is similar to those to be found on a 747. 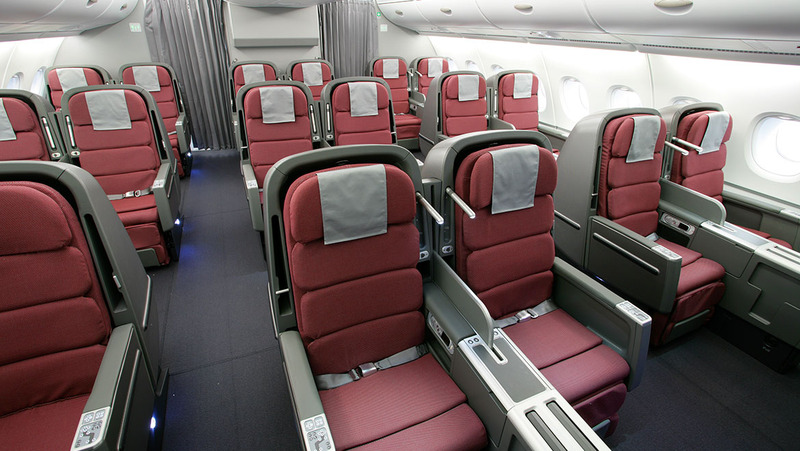 Premium economy with 32 seats is located behind business class on the upper deck and is a cosy cabin with lots of seats with extra leg room. For the long suffering economy passengers Newson has delivered an “ultra modern cabin” with some clever features. Australian Aviation’s editor Gerard Frawley at 189cm and the author at 193cm took a special interest in economy to see how Qantas was handling the “search for space” on its new spaceship. Newson explained that the A380 economy seat was a step forward in that it slid forward and up slightly when reclined, giving both support for the passenger and extra shin and leg room for the passenger behind. A thoughtful change was the scrapping of the metal leg rest which was more of an irritant than anything else, and this is replaced by a highly sprung netting arrangement which lifts and supports your feet. When not in use it is flush under the seat in front. Both when sitting normally and reclined the author had ‘enough’ room to move and sit comfortably, but of course another few centimetres would never go astray. However, with the economics of flying in today’s market every centimetre counts. 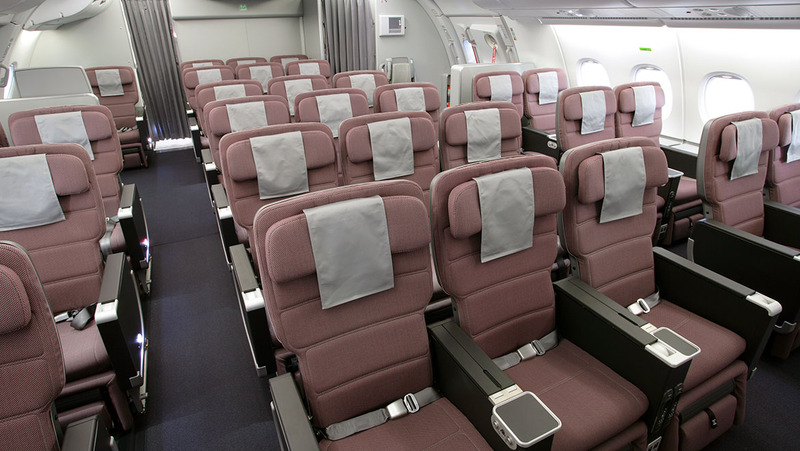 Australian Aviation’s economy seat test lasted about an hour, possibly not long enough to get a true sense for the comfort level for a long haul flight, but the overall impression was of an improvement for the majority of travellers. At the rear of economy there is a small self-service bar area which is adjacent to about five toilets – not exactly what the Airbus marketers had in mind. One aspect that exceeded the media expectations was the new IFE system by Panasonic, which performed flawlessly on the delivery flight from Toulouse. One feature that no one appeared to know about was the Skycam, which can be found under ‘Flight Information’. Skycam is identical to the tail camera installed on Emirates’ s A380s, although the Qantas vision appears clearer and sharper. But one major downside was that in all classes except economy, passengers’ screens need to be stowed for taxi, take-off and landing, thus denying passengers the best elements of the outside action. Perhaps a large LCD screen at the front of each cabin might be in order. Newson has created a magnificent interior, and while it bears no resemblance to the Airbus marketing department’s spin, it is a big step forward for the passenger in the harsh reality of airline economics.